Sometime in the near future I will have a clean house so I can invite people over and not have to say things like, “sorry about the mess” or “I’m not really sure where that smell is coming from.” But until that time, we have all our game nights over at my friend Lillian’s house. This is good because Lillian likes to make snacks for us. And we! love! snacks! Also this is good because I have a terrible fear of leaving people out. Insane fear, even. But because it’s not at my house, I’m not in charge of who is invited and who is not. Though, if you want to come, I’m sure Lillian would let you. She’s very welcoming. There are a handful of times in my life where I’ve laughed so hard, I was in physical pain. Most of them happened at game night. You see, when you get a group of 8-20 adults together (ages 20-50) and play things like *Telephone-Pictionary and Things, you’re going to do a lot of laughing. We are particularly raucous. Often we’re laughing at inappropriate things, of course, but sometimes not… probably? This is me realizing that I took the game to a completely terrible place on accident. I really think it was Dave’s fault for drawing the picture he drew in Telephone-Pictionary. It was really really awful. 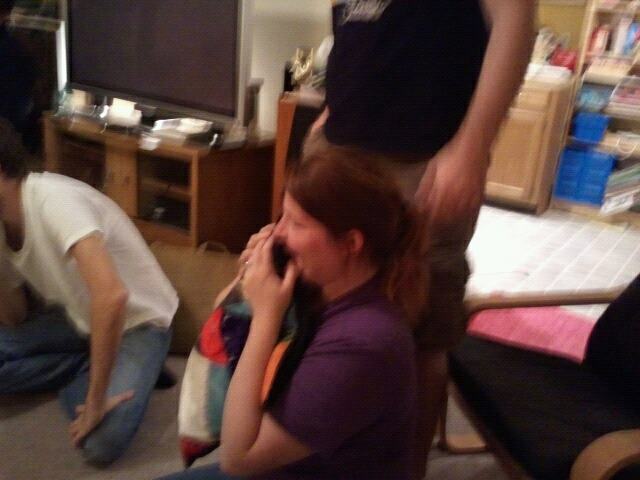 Pardon the blurry cell shot, that’s the kind of picture you take when you’re violently shaking from laughter. So, here’s the thing. 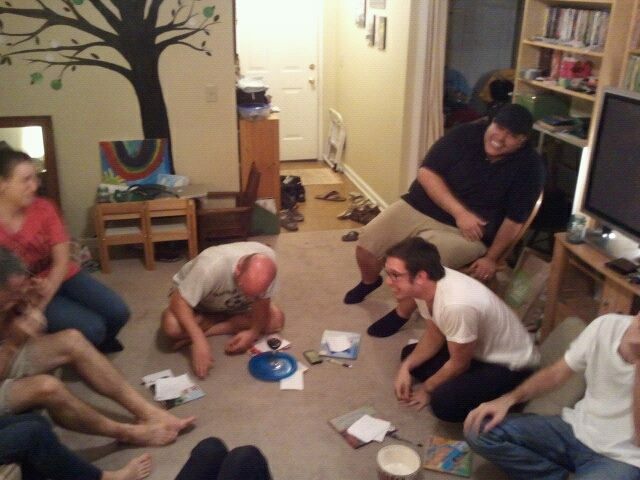 If you want to have super-awesome game nights at your house, here are some tips: 1) the more the merrier. Game nights can get a little awkward with just a few people. 2) play a game that isn’t TOO competitive. People get weird when they’re competing. Things and Telephone-Pictionary are perfect. 3) recurring jokes are a hit. If someone is new to the party, catch them up before hand on some common inside jokes so they don’t feel like the odd man out. So try it out. Make some new friends, get closer to the ones you’ve already got. If you try it, this may be you lying on the floor and crying because you’re laughing so hard. *For instructions to play Telephone-Pictionary, go here. This entry was posted in Uncategorized by steph hagen. Bookmark the permalink. Game nights for families with kids work great too – it needs to happen at a house with 2 separate areas. Hire a college student to watch the kids (easiest babysitting job in the world because all the parents are in the house anyway). Put the kids in their own area with their own games & crafts, their own snack table and at least 1 kid-friendly movie to watch for the last 1-2 hours when they get tired of games. All parents tell kids that they have to stay in the kid area for the duration, and put some money in the babysitter jar (babysitter makes a killing – parents pay less than they would to go out). Adults in their own area with their own snacks and their own games. Everybody has huge amounts of fun! When we did this, we had a food theme for each night and asked each family to bring a snack to share. We got to taste awesome new things that way too. Works best with kids ages 4 and up – the littler people need their own houses/beds to truely be happy at night.